Youth Classes will be held from 5:30-6:15pm; Adult Classes from 6:30-7:30pm. Pre-registration is required and space is limited. Did you find a new guitar under the tree? Want to learn how to use it? OCPR is offering youth acoustic guitar lessons! Classes will be held in the Sedwick Building upstairs conference room (this is the same building as the OCPR office and the Orange Public Library) on Wednesdays, Jan.9-Feb.7, 2019. Classes will be held from 5:30-6:15pm. The registration fee is $90. Students should provide their own guitar, but other materials will be provided. Pre-registration is required and space is limited. Registrations received after the 12/28/18 deadline will be charged a $10 late fee. A youth class is also available, please visit our winter youth programs page for details. 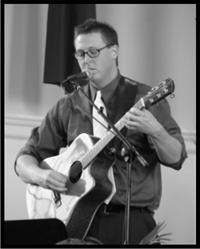 Our instructor, Aubrey Driggers, has been playing music around Delaware, Washington DC, Virginia, and Florida for 20 years. He is trained in classical guitar, folk and jazz styles. If you are looking to begin playing guitar or learn the joys of making music, then this class is for you.